Buckwheat has a wonderful sweet, earth flavor and aroma that makes everything smell so home-y. And it’s completely gluten free, which is confusing, since the word “wheat” is in its title. I’d been toying around with a gluten free pancake recipe for awhile and nothing really sang to me, but this morning I struck gold with these babies. They’re hearty pancakes for sure, but they’re also light and fluffy. I think the main difference in texture between these and white flour pancakes is that they’re a bit grainier and less flexible. But who cares if they’re less flexible because you’re not gonna’ bend them, you’re gonna’ eat them. The recipe has quite a few ingredients that you probably don’t have laying around the house unless you’re a compulsive grocery shopper (like me) or follow a gluten free diet, so if you like, you can replace the quinoa and corn flour with whole wheat pastry flour (or regular flour) and leave out the tapioca flour and flax seeds. You may need to thin the batter with a bit of water in that case. The recipe is below. Isn’t buckwheat just plain ole kasha? Thanks for the gluten free recipe. I actually have most of this in my pantry! Frank – kasha is toasted buckwheat. These are great – really fluffy. I used 1/4 brown rice flour, and 1/4 chickpea flour instead of the corn and quinoa flour. I used 2 Tbs arrowroot flour/powder instead of tapioca and I was too lazy to grind up flax seeds so I omitted that. Thanks! I just tried this! They were fabulous–I used GF oat flour instead of buckwheat and only one tbsp of oil, and they still turned out great! Canola and any canola oil products are pure trash to the system. I haven’t tried this recipe out yet, though will because it looks fabulous, but is that 1 tablespoon baking powder a mistake? Seems like a ton to mix in with only a little over 1 cup of flours. Perhaps it was supposed to say 1 teaspoon? It’s easy to make your own healthy and fluffy homemade Denny’s pancakes with this easy-to-follow Denny’s flannel cake formula with healthy ingredients, such as Whole Meal Flour and Canola, served with a dollop of cream cheese and staring maple syrup or love, or create your own healthy flannel cake toppings. I went gluten free this summer after finally pinpointing the source of all my indigestion (Damn Gluten!) and these are my favourite pancakes EVER including non-vegan, glutenized ones. YUM! Is there a way to do these oil-free (low fat)? Can this batter be used in a waffle iron? I had some buckwheat flour lying around and now I know what to do with it. Thank you, Isa. Nice recipe. The full tablespoon of baking powder seems to be ok. Can’t taste it and the cakes are nice and fluffy. Also works very well in the waffle iron 🙂 Just tried it. Fabulous recipe! Just made it, LOVE it! Thank you so much for posting some gluten free options! Being Vegan can be tough enough in the morning to pick out something quick and nutritious to eat, and add gluten free into the mix and it can get really tough. These are amazing!! Seriously the best pancakes ever! Wellness Wednesday: [kill whitey] « .rebel grrrl academy: revolution in the shoproom, the classroom, the streets & the hips. [kill whitey] | .the rebel grrl kitchen. Any solid discuss, I recently with all this on a colleague who was simply performing somewhat examination with this. And that he in reality bought me breakfast time simply because I came across it regarding him or her.. smile. Therefore allow me to edit that: Thnx for your deal with! However yeah Thnkx regarding shelling out the time to debate this kind of, I seriously feel firmly about this and adore researching more about this particular matter. When doable, as you grow expertise, would you brain updating your site with added information? It is extremely useful for me personally. Huge thumb upward for this website put up! Is it just me or is the essential ingredient missing? I don’t see buckwheat flour anywhere in the recipe. Haven’t tried these yet but I’d like to. Michelle — The 1/2 cup buckwheat flour is the first ingredient but it is formatted in the wrong place. These turned out well – very filling, and a nice whole taste. I didn’t have corn flour, so for that 1/4 cup I used half fine corn meal and half Bob’s Redmill gluten free mix, and I used the mix instead of the quinoa flour too. Since the mix has tapioca in it, I used 1 tablespoon tapioca and one cornstarch. 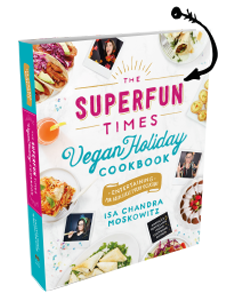 Post Punk Kitchen is Isa Chandra’s old web site, i.e., this website has the same cookbook author as that one. I love this recipe! I haven’t been a big pancake person in the past because they never seemed very nutritious but with the buckwheat flour they feel wholesome and taste delicious! Thanks Isa! After making your pancakes, I served them with a side of this gluten-free vegan chocolate chip banana bread. I have used this recipe a bajillion times and it always delivers and they are better than wheat pancakes to me. The buckwheat is lighter has a sweet earthy taste which i love. Thank you Isa, for another awesome recipe! 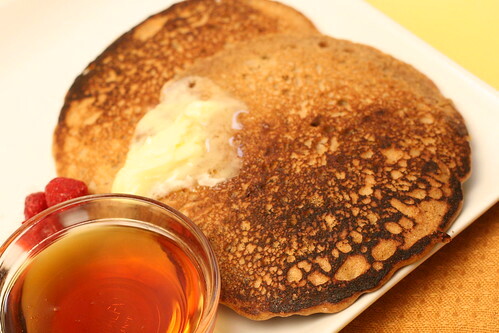 Perfect pancakes with a hefty dose of whole grains. Could I make a big batch of all the dry ingredients and store it? I made these this morning and substituted 1/2 cup almond flour for the quinoa and corn flours. It was super fluffy and had a delicious taste! Will definitely make again. What a great way to beat the bloat. Great post as usual. Could you use coconut flour instead of corn? Or can I increase quinoa amount ? Isa, thank you! Mine were colored like walnut wood though. I didn’t have corn flour, so was planning on doubling the quinoa, but I think I forgot to, so just used 1/2c buckwheat and 1/4c quinoa. I think. They didn’t spread well on the skillet either. But they were pretty bendable! Isa, can you PLEASE, PLEASE, PLEASE come up with a gluten-free sandwich bread recipe!!! I’ve been dying over here without sammiches for months now! Please!!! I have been in a gluten free diet since my childhood, because I have a food allergy. Yum, fabulous recipe. I made it for my grandpa and my uncle and they loved it. For me, was really tasty. My uncle is always worried for my diet, but I know it´s because he loves me. I don´t know how to make flan. I always need to talk to a supervisor. just made these for breakfast. Used all milk instead of water. Yum! Ideal for breakfast i enjoyed so much!